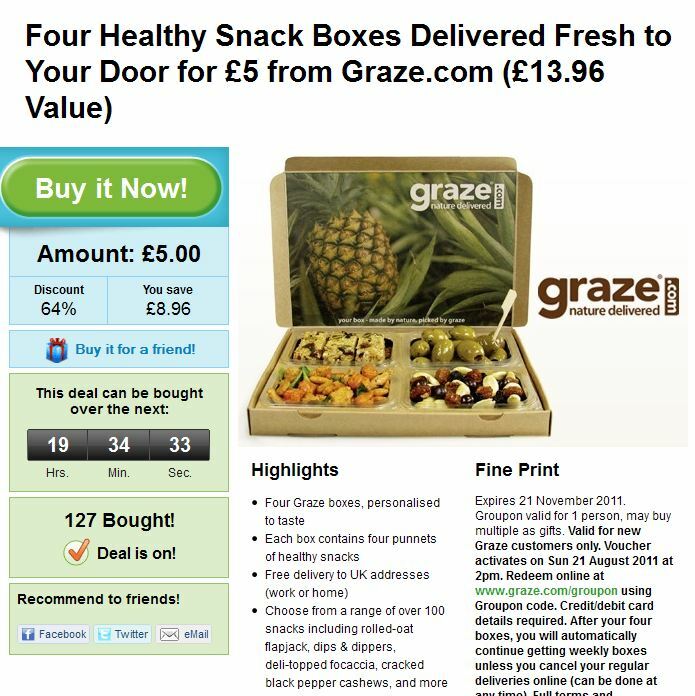 I’ve seen these Graze snack boxes reviewed on a number of beauty blogs over the last year and when I saw this deal pop up last night, I took the plunge! The deal’s valid until midnight tonight and I’ve bought it for Mr. L because I’m still on mega-diet-from-hell until I’ve shed my final couple of stone. It’s always the last push that’s the hardest huh? Is £5 for 4 a good deal? I know they sometimes give one away for a £1 but I don’t think you can get more than that. Let me know if you indulge and more importantly, tell me what your favourite Graze selections are so I don’t choose the revolting ones! Flapjacks, honey glazed nuts and anything with chocolate- deeeeelish! This is a great deal, I love getting a Graze box through the post it’s like a mini Christmas! Mmmmm graze. I started with one of these promotions and they have me hooked now! Be warned that they are addictive! I like most of what I’ve had through; the bread is lovely but doesn’t come often. If you would like bread please check that you have your box delivery set for Tuesday to Saturday as they need time after the weekend to get it ready. The dried fruit is semi rehydrated so it’s slightly moist and squishy. I think it’s lovely but some people find the texture strange. I hope the info helps anyway. Enjoy!